Educational Games provide an unfair advantage to parents. We get to provide hours of entertainment for our kids, while strengthening skills they've already learned, sometimes un-beknownst to them. Afterall, children learn best through play. These games and resources not only support reading habits, but they are hand picked to reinforce a variety of grade school subjects such as: geography, math, reading comprehension, and English for elementary school children. And best of all, they're free. Check out how my kids have taken some classic games and added a fun twist to them. I like to call it edu-tainment: the intersection of education and entertainment. Who would have thought you could use candy to make educational games? Candy Bar Craze is a really cool game that supports reading, writing, and creativity. 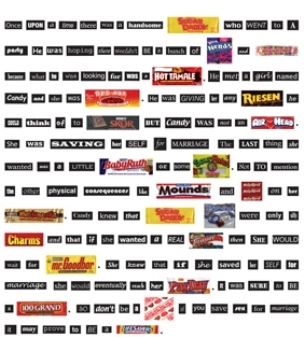 The object of the game is to write a story using at least 1 candy bar in each sentence. This can be played in groups with each person taking a turn. The person that uses the most candy bars wins. You decide whether the winner takes all the candy OR 1st place winner chooses his favorite candies. Then, 2nd place chooses his favorite, and continuing on with 3rd and 4th places until all the candy has been awarded. You will need to purchase several candy bars. Sample candy bars would be: Mr. Goodbar, PayDay, Bit of Honey, 5th Avenue, Chunky, Baby Ruth, Nerds, Smarties, Air Head, and dum dums. You can use a chalkboard or dry erase board to write the various stories and tape the candy in the appropriate places. If you don't have either of those, several large poster boards will work just fine (depending on the number of participants). Instead of taping the candy bars in place, each child would write the name of the candy bars on their posterboards. This game is a HUGE hit with kids and is perfect at home, school, or birthday parties. Mad Libs is one of my favorite educational games. It allows you to create a funny story using random word substitutions. The players will not see the story until after they've chosen their word selections. I like to add a slight variation when I play with my kids. I ask them to make up stories for me to fill in the blank with the appropriate parts of speech. They get a big kick out of reading the wacky tales that result from their stories and the words I choose to fill in the blank. In order to write a good story, they are challenged to use the correct parts of speech (noun,verb, pronouns, adjectives) in the proper context of their story. It also encourages them to write with their most creative voice, because they know it will be read by myself or others. Wacky Web Tales is a great website that has mad libs online for kids to fill in the blank and read the story that is the result. Whether they make up the stories or they fill in the blank using someone elses story, they'll be edu - tained for hours. ABC Picnic Game is a great game to reinforce phonics and the different sounds of the alphabet. Kids are challenged to use common words and think about their beginning sound. It also enforces quick thinking. There's nothing like a good old fashioned Scavenger Hunt to keep kids from getting bored on rainy days, to strengthen reading comprehension, and attention to detail. Click the link above to see some of my favorite variations that provide plenty of edu-tainment. Write down silly instructions on index cards for your kids to draw from a bag and follow the instuctions. Simon says touch your nose, and stand on 1 foot, while singing the ABC song. Each player draws a card and gets aproximately 5 -10 seconds to reads the instructions. They must then give the card to the designated "simon" without being allowed to read the instructions again. "Simon" must check to see if they've followed the directions completely without missing any of the steps. This educational game teaches enforces reading comprehension, following instructions, memory, and thinking quickly. Free Educational Games is a wonderful resource for anyone that's thirsty for more choices for young children. Not only will you find free educational games, but excellent toys and gifts that you can purchase for children under 12. Happy Endings is game that be played with 1 child or an entire class room. Take a new book - possibly one that no one in the group has read before, and read the entire book, with the exception of the last few pages. Then have each person to write their own ending. See how many different endings the group can come up with that are as close to the book as possible. Game game to stimulate creativity. I love friendly, easy to use, technology with a purpose. For those kids that love the excitement of electronics, digital graphics, and video games - these games will give the same sensation of Technology, but with a different purpose: interactive learning goals.